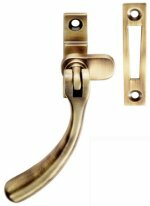 Solid brass bulb bend casement window stay in 8 inch (202mm), 10 inch (253mm) & 12 inch (305mm) sizes. Available in Polished Brass, Polished Chrome, Satin Chrome, Satin Nickel & Polished Nickel. Solid brass bulb bend casement window fastener with a mortice plate and hook. Suitable for standard windows or weather stripped windows. Solid brass casement window stay, size 8 inch (202mm), 10 inch (254mm) and 12 inch (305mm) sizes. Available in Polished Brass, Polished Chrome, Satin Chrome & Satin Nickel. 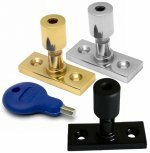 Solid brass reversible casement window fastener, with hook and mortice plates, back plate size 57 x 15mm. Solid brass wedge pattern casement window fastener, back plate size 57 x 15mm. Locking version and none locking version, not suitable for weather stripped windows. Lockable window casement fastener, wedge pattern type. Back plate size 13mm x 57mm. Available in Polished Brass, Polished Chrome & Satin Chrome. Lockable window casement fastener with night vent. Allows window to be locked in a part open position over night. Back plate size 16mm x 60mm. 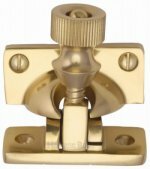 Solid brass fitch pattern sash window fastener, in a standard fastener or locking fastener. Size 66 x 17mm. Solid brass architectural quality quadrant sash window fastener, in a standard fastener or lockable fastener type. Size 69 x 20mm. Solid brass quadrant sash window fastener, size 69mm x 20mm. 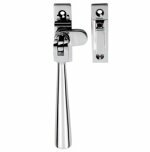 Avaialable in Polished Brass, Polished Chrome, Satin Chrome, Antique Brass & Satin Nickel. Solid brass architectural quality brighton pattern sash window fastener, backplate 58mm x 23mm. Solid brass brighton pattern sash window fastener, backplate 57mm x 20mm. Solid brass architectural quality sash lift, backplate 51mm x 20mm, overall height 42mm. Solid cast brass sash window lift, backplate size 47mm x 20mm, overall height 43mm. Avaialable in Polished Brass, Polished Chrome & Satin Chrome. Sash window ball bearing axle pulley, 1 ¾ inch wheel. Pulley size forend 117.5mm x 25.4mm, body 76mm x 39mm. Available in Polished Brass, Polished Chrome and Satin Chrome. 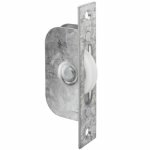 Heavy duty ball bearing sash window axle pulley with 2 ¼ inch wheel. Pulley size forend 127mm x 31.8mm, body 83mm x 50mm. 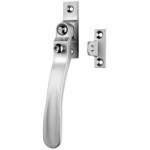 Available in Polished Brass, Polished Chrome and Satin Chrome with square forend as standard, with 4 fixing screws, or radius profile with 2 fixing screws. 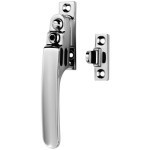 Screw pattern casement window stay, allows window to be locked in place on opening. Size 10 inch 254mm. Solid unlacquered brass monkeytail casement window fastener, suitable for left or right handed windows. Over time the brass will acquire a darker, more aged patina if not treated with a brass polish. Solid unlacquered brass monkeytail casement window stay, available in 8inch, 10inch and 12inch sizes. Quadrant arm stays for restricting the opening of lightweight bottom hinged inward opening fanlight windows. Size 150mm, sold in pairs. Spring loaded fanlight catch for latching bottom hinged inward opening fanlight windows. Fitted with a 28mm diameter ring, supplied complete with flat receiver plate and receiver staple, back plate 45 x 45mm. Serozzetta window casement stay in 254mm sizes. Available in Polished Chrome, Satin Chrome & Satin Nickel. Serozzetta window casement fastener, length 120mm. Available in Polished Chrome, Satin Chrome & Satin Nickel. Florentine bronze finish bulb bend casement window fastener, to fit standard windows with a mortice plate or weather stripped windows with hook or mortice plate, size 98mm. Florentine bronze bulb bend casement window stay. Size 10 inch (253mm). Roller arm window stay, size 150mm. Solid brass pin for flush fitting sash windows, size 42mm x 39mm. Locking pin for use with window casement stays. Plate size 16mm x 41mm. The pin is very simple to use - simply replace one of your standard stay pins with the locking pin. The pin then can be locked into place using the key supplied. Available in Polished Brass, Florentine Bronze, Polished Chrome, Satin Chrome, Black & Satin Nickel.